This is some very brave advertising by Dixons and you can see the copywriter has had great fun in constructing it. Its beautifully written, there’s no doubt about that, but is it good for the long term health of the Dixons brand? For me, ever since Dixons profits showed that they made more money selling warranties that we didn’t need than they did from the products themselves, they showed their true colours as sales charlatans. Their brad values were short term opportunistic profits. They became the brand that people loved to hate. John Lewis, with their sensible people offering sensible prices in sensible locations became the choice of sensible people and they filed that void left behind by the Dixons customers who deserted them. They became a better than viable alternative. But just recently, I’ve started falling out of love with John Lewis. I don’t believe their people are that nice. I don’t actually believe they are never knowingly undersold as I can always find cheaper (they don’t want or allow you to compare their prices with online prices you see!) and I began to doubt the value of their brand promise when I (over)heard people being knocked back when they were trying to return things a few days out of warranty. So after I’ve walked through the hallowed halls of John Lewis, played with their docking stations, left funny messages on the screens of their laptops, logged them into things they shouldn’t be and and had their sensible staff come along and offer to help me, will I go to Dixons last? No. Actually I won’t. I’ll go home and buy it online from Amazon, or another online retailer where I know where I stand, I know where and when it will be delivered and where I know that, at the moment at least, I’m a valued customer. Good try Dixons, but I still think you’re too shady to get my custom in the near future. Keep this up though and I’ll certainly come back into store to look. 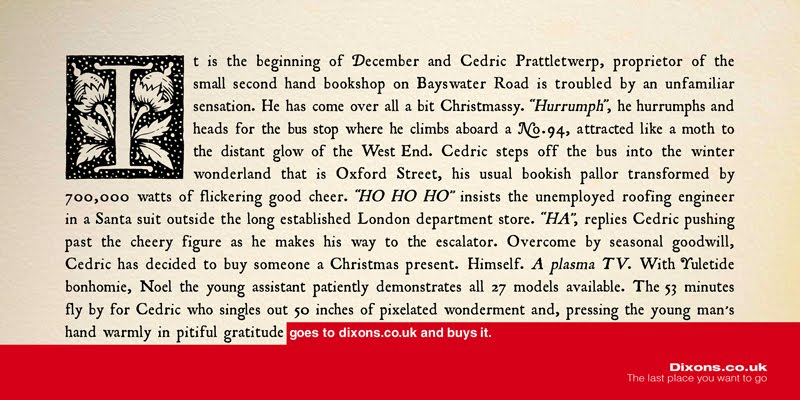 Another brilliant written and crafted ad from Dixons. I’m starting to think they actually deserve some success in what they are doing as they have captured most of our thoughts and more importantly, our actions, pretty damn well. Another brave ad from Dixons capturing the spirit of what we're actually doing! When I saw the advert, I immediately thought of you – well, in particular, what you thought! A lot of this is obviously about expectations and experience. I had a ‘great’ experience in Curry’s a month or two ago. I wasn’t expecting much, but got brilliant advice and service – they ‘exceeded’ my expectations. Is this Dixon’s trying to ‘lower expectations’? Hey, you’ll get crap service, but you’ll get it cheap? As you say, if it’s only about price, the internet sites will do very nicely thank you. Curry’s, Dixons and Argos all fall into broadly the same space for me. They’re all a bit crap and anything they can do to make the experience less than hateful would be an improvement. I still wouldn’t want to hang out there, or more worrying from a brand perspective ‘be seen’ hanging out there. There’s not many kids walking round the streets proudly swinging Dixons bags are there? Um… you do know that Dixons IS an online retailer, and only an online retailer. They closed all their stores in the UK in 2006, and concentrated on the Currys high st brand. You’re going to have a hard time looking round their stores – no matter how good their advertising is.. I didn’t know that, but I do now. I hardly mourned their passing! Thanks for the update though. We have a retailer near me that i thought was a Dixons, but I went over to have a look and it’s a Curry’s Digital in the place that Dixons used to be and I hadn’t noticed the change as it still looks shiny and unpleasant! Even more of a risk to me if I don’t trust them and they don’t have a shop to go back to complain at!